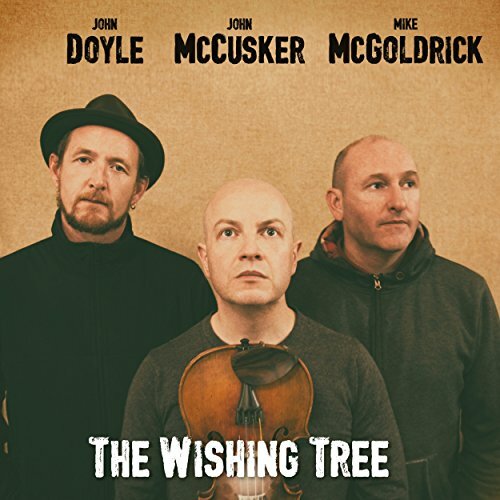 The Wishing Tree is, believe it or not, the first studio recording by the redoubtable trio of John Doyle (guitar), John McCusker (fiddle/whistle) and Mike McGoldrick (flute/whistle/uilleann pipes). They do seem to have been around forever and continue to play together in different combinations on each other’s and on other people’s albums – Doyle and McGoldrick featured on last year’s excellent Usher’s Island release and McGoldrick is about to release his fifth solo album. So The Wishing Tree was certainly long awaited – their previous live album was recorded in 2009 and released in 2012 – but it was definitely worth the wait. Not every track immediately reveals its’ depths, but that subtlety is at the core what makes this such a great album. The trio started out following their first Transatlantic Sessions together in 2007 – a project all three continue to be involved in. When you are as busy as these three ‘top of their game’ musicians, you find time when and where you can. Mike McGoldrick said that just a few days before they recorded the album he and John Doyle went out to eat to have a discussion about what tunes and songs they might record. No slick advanced planning here then, and none needed. Anyone who has seen them play live will know only too well how comfortable they are in each other’s musical company and how well they pick up and follow each other’s musical cues. A feature of their work collectively and individually is a well-founded confidence in writing their own tunes and songs and The Wishing Tree kicks off with a typically self-assured driving set of reels, two from McCusker and one from McGoldrick. The first and titular track was aired on McCusker’s Scots Trad Music Award nominated 2016 Hello, Goodbye album. It starts with John Doyle’s familiar rhythmic guitar and then reassuringly, matched stride for stride, the fiddle and flute come in. The next two tunes in the set are no less breezy. Dearne Valley Reel by McGoldrick, the last of these, is named after the location of the studio near Doncaster where the album was recorded. A music workshop was set up in 1985 just after the miner’s strike to alleviate the problems of unemployment in the area. They now enjoy an affordable, state of the art studio which is well used by local bands and community organisations.